This is a story about a young boy's epic journey across Europe, and his budding emotions and sense of the wonder of life. The facts are simple. David is a 12 year old boy. He has lived all his life in a concentration camp somewhere in eastern Europe. He does not know anything about his parents or where he comes from, or why he is in the camp. All he knows is that he is David. One day, without any explanation, a guard arranges for him to escape. The electric current is switched off from the perimeter fence for half a minute, just long enough for David to climb over. He is given bread and water and a compass. He is told to head south for Salonica, stow away on a ship sailing to Italy, and then walk north until he comes to a country called Denmark. And that is what David does. Now, what kind of person would you be if you had spent all your life in a concentration camp? The first thing you may notice about David is his extraordinary isolation. He has survived in the camp by never allowing himself to think further than the next meal. After the death of his friend and teacher, Johannes, he never permits himself to have any affection for anyone. Out of the camp and on the run he believes, not unreasonably, that 'they' are after him. Of all the people that he meets on his long journey, he doesn't feel able to trust anyone. And so he shoulders the burden of the journey alone. Consequently, of course, all the judgments he makes about other people and their actions, and his own actions, are governed entirely by his own moral standards. Haven't you seen that David hates Carlo? Not like boys who fight and then forget about it because there is really nothing serious to fight over. David hates Carlo as a grown man hates. He talks to him only when he has to, and then he speaks politely and coldly and refuses to look at him. But as David journeys across Europe he begins to comprehend that he cannot live life entirely alone. He does need other people, Maria, whom he saves from the fire, and the dog, and perhaps a mother of his own ... And it works the other way round - other people may need things from him. It is not good enough for David simply to hate evil when he finds it in others. If others say they are sorry for their evil acts then he must also learn to forgive, because relentless unforgiving is another kind of cruelty. The book is not set in a real time or place. Although the circumstances seem real enough, David's background is a synthesis of all the terrible persecution that happened during the Second World War and the subsequent years of cold war communism. This helps to make David a very powerful and pure figure. I don't think he is particularly real. Anne Holm uses him as a blank canvas on which can be drawn the first experiences of life - beauty, knowledge, trust, religion, love, everything. More of a discussion paper than an adventure story, but atmospheric and quite thought-provoking. 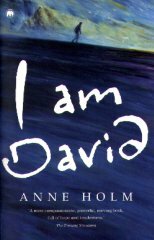 If you want to know whether David eventually finds a place to settle down, you will have to read the book.